When the holidays swing around, I love to gift homemade things, but sometimes…not everyone wants that knit scarf you spent hours making. I’m not saying you shouldn’t make your beloved craft gifts, I’m just saying…you know there are some people who will appreciate the hours you spent knitting and there are others who won’t appreciate your gift as much. Crafty people, you feel me right? In addition to different levels of appreciation, there’s also the time factor. With many handmade gifts requiring hours of your attention, there’s truly only so many handmade gifts you can make every season. Well home-made-gift-loving-friends, I have a solution for you with this Cookies ‘N Cream Bark Recipe. It’s CANDY! Homemade candy, that is. Anywho, this homemade candy would be a fabulous gift to give any time of year, but I’m gifting mine away for Christmas 2010. If my pink salted caramels seemed too daunting for you, I have an even easier solution. This candy is practically no-cook. This candy is…Bark. All you really need to do to make bark is melt some chocolate and mix/sprinkle in cookies, nuts, or candy. Wait. Break. Package. Seriously…it’s a no brainer. Not only is bark easy to make, but it looks fancy, too, so you’ll get major brownie points for putting this simple candy together. 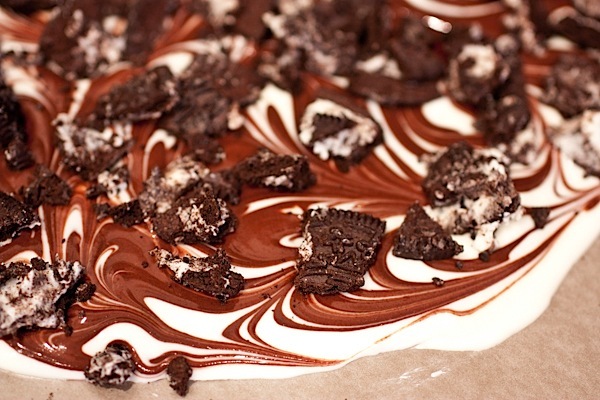 In this post, I’m going to show you how to make Cookies ‘N Cream bark. 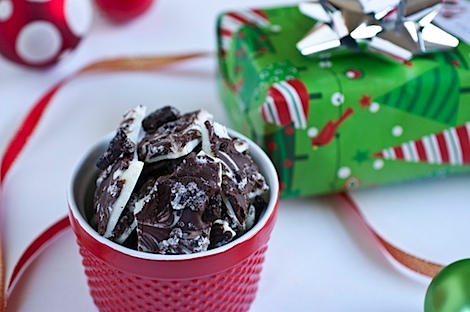 To make Cookies ‘N Cream bark, you’ll need white chocolate chips, semi-sweet chocolate chips, and cream-filled chocolate cookies. 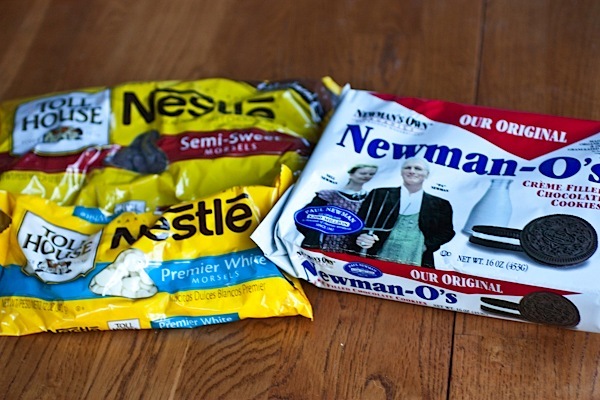 You can use Oreos, but I like Newman’s Own Newman-O’s for the more natural ingredient list. 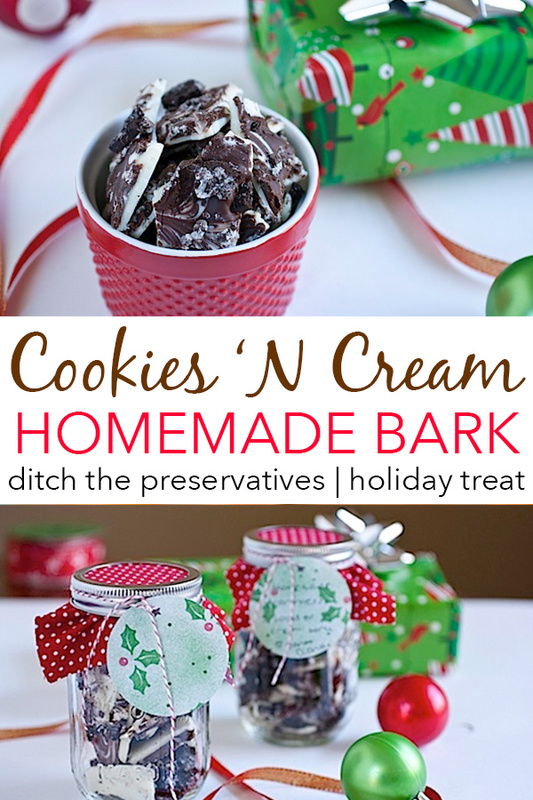 I decided to go visual, but there’s a printable version of the recipe at the end of this post, along with a link to a cute packaging tutorial if you’re gifting this yummy bark for the holidays. Place your white chocolate chips in a double boiler over medium (or medium low depending on your stove…just hot enough to melt the chocolate) to get the chips melting. If you don’t have a double boiler (like me), use a heat safe bowl over a pot filled with roughly enough water to fill the pot 1 inch up the side. The amount of water you need will vary depending on your bowl and pot, but basically, you want enough water so it doesn’t boil away but you don’t want the bottom of the bowl to touch the water. Repeat with the semi-sweet chocolate chips in a separate double-boiler (or pot set-up as described above). If you don’t have a double boiler or pot set-up, you can place the chips in separate microwave safe bowls and heat at 30 second increments, stirring between each increment, until the chocolate is melted. Meanwhile, get your cookies out. 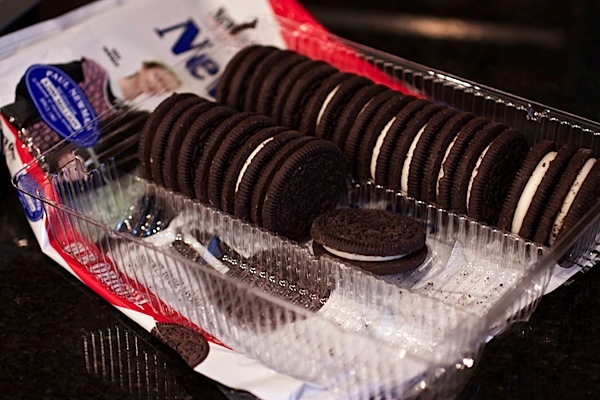 Place them in a large, sealed plastic bag (try to get the extra air out before sealing). Gently tap the cookies with a rolling pin or back of a large spoon…whatever you need to break the cookies into smaller pieces. When the white chocolate is melted, pour it into a baking sheet lined with wax paper. With the back of a spatula, spread the chocolate out to an even layer – about 1/4 inch high or to your thickness preference. 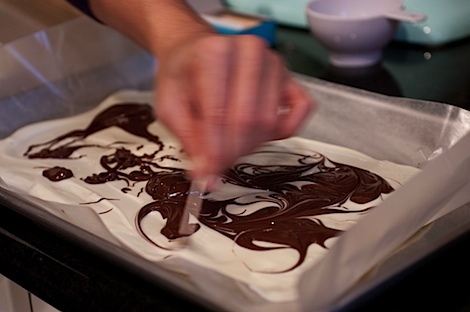 Pour the melted semi-sweet chocolate on top of the white chocolate and use a tooth pick to draw swirls in the chocolate, careful to not catch the wax paper below. Before the chocolate sets, sprinkle broken cookies (or remaining cookie pieces if you went with the optional step above) over the chocolate and gently press into the chocolate. Wait at least 1 hour with bark at room temperature. When bark is set, break into small pieces. And you’re done. See…I told you that was easy. Now go ahead and do a little taste test before packaging to give to your friends and family. 😉 You deserve it! As I alluded to on my pink salted caramel post, I have a simple and beautiful packaging idea for you that I’ll be sharing shortly. Stay tuned for details, but here’s a photo preview for you lovely readers! 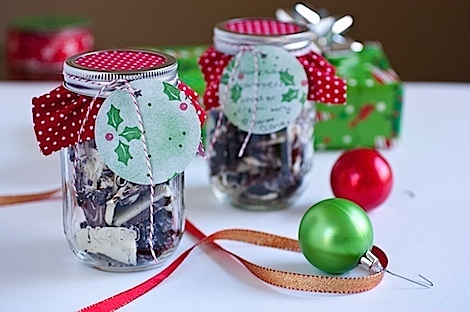 Click here for an easy DIY holiday mason jar decoration tutorial. 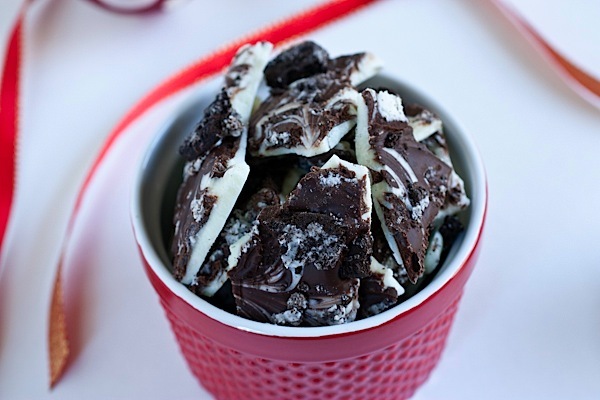 This Cookies ‘N Cream Bark Recipe couldn’t be simpler. 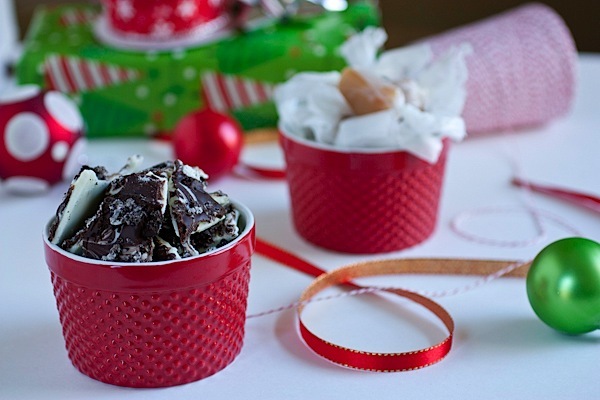 It makes for a great homemade holiday gift idea or dessert for a pot luck! This dessert whips up in a jiffy – only about 10 minutes. The hard/slow part is waiting for it to set! Be sure to check out the link at the end of the post for a cute packaging tutorial. 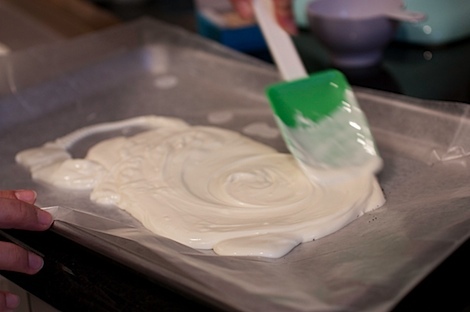 Cover 1-2 baking sheets with wax paper. The number of sheets needed will depend on the size of your sheets. I used 2. 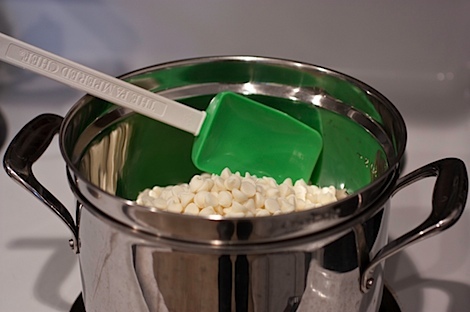 Place your white chocolate chips in a double boiler over medium (or medium low depending on your stove…just hot enough to melt the chocolate) to get the chips melting. If you don’t have a double boiler (like me), use a heat safe bowl over a pot filled with roughly enough water to fill the pot 1 inch up the side. Note: The amount of water you need will vary depending on your bowl and pot, but basically, you want enough water so it doesn’t boil away but you don’t want the bottom of the bowl to touch the water. Meanwhile, get your cookies out. 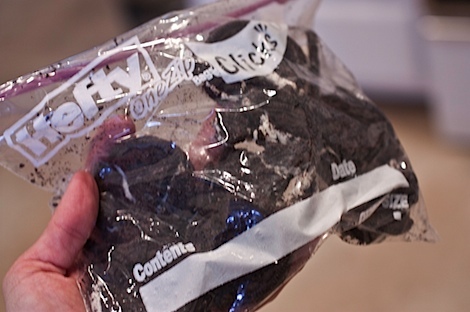 Place them in a large, sealed plastic bag (try to get the extra air out before sealing). Gently tap the cookies with a rolling pin or back of a large spoon…whatever you need to break the cookies into smaller pieces. 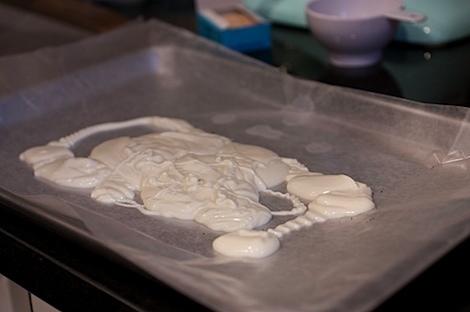 When the white chocolate is melted, pour it the prepared baking sheet(s). And you’re done. See…I told you that was easy. Now go ahead and do a little taste test before packaging to give to your friends and family. 😉 You deserve it! Note: If you don’t have a double boiler or pot set-up, you can place the chips in separate microwave safe bowls and heat at 30 second increments, stirring between each increment, until the chocolate is melted. PS This bark is not only great for gifts, but also to serve at a dinner party or to take to pot lucks and other food-sharing parties. I can’t wait to experiment with this bark recipe and try some new flavors! What’s your favorite type of bark? You just created my favorite type of bark 🙂 Looks DIVINE! That seriously does look ridiculously professional for being so easy! Very nice! Now this kind of recipe is right up my alley and I think I may have to try it tomorrow. I bet it would be good with Grasshopper Girlscout cookies! Love this simple recipe! I was having trouble finding what to make for my friend’s birthday and this is perfect — no baking and easy clean up 😉 Can’t wait for your packaging post! That bark looks so delicious! That looks AWESOME Diana! Merry Christmas!!! I think the best part about this is that if the person you’re gifting it to doesn’t love it..you can just keep it to yourself. The gift that keeps on giving. I found this recipe 3 yrs ago on Kraft Kitchens and I have been making it ever since! The recipe on kraft kitchens calls for bakers semi sweet chocolates not chips but i think the chips would be more economical. My friends all said it was the BEST homemade gift ever! This is going to be my holiday gift this year at work for sure! Thank you so much!! Nice! Hope your co-workers enjoy the bark! 🙂 You’re welcome! How long can you store this in a mason jar? I’m actually not sure. It never stays around long enough for me to find out! 😉 I found some tips on this site (click).